Katherine Schwarzenegger is absolutely glowing and it's probably because of the massive sparkler on her wedding finger. 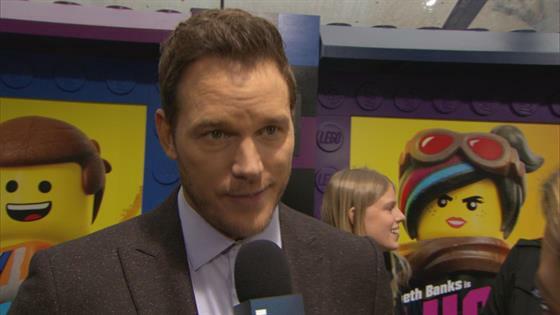 The 29-year-old proved she is the ultimate supportive fiancé by promoting Chris Pratt's Lego Movie 2 in her latest Instagram post, in which her diamond ring definitely stole the show. In the cute photo, Katherine holds two Lego action figures in her left hand, thus giving her engagement ring the perfect opportunity to shine. "So incredibly proud of my amazing, talented and hardworking fiancé everyday, but especially today because his movie, THE LEGO MOVIE 2, IS FINALLY OUT!" The author shared, "These special little characters (that were played with every morning and night) Emmet and Rex are voiced by my love, and he did such a great job!" The engagement ring is estimated to be worth a whopping $150,000-175,000 by WP Diamonds President Andrew Brown. "The beautiful engagement ring Chris Pratt just used to propose to Katherine Schwarzenegger looks like a 5-carat cushion set in a Harry Winston-style micro pavé halo," the expert told E! News in early January. It's been less than a month since the stars announced their engagement and wedding plans are well underway. A source previously told E! News that Pratt and his bride are planning a summertime wedding in Martha's Vineyard back east, where the Kennedy family compound is located. Unsurprisingly, the big day will be "very traditional" and Chris wants to give his bride "whatever she wants." It may not be happening yet, but who else already has a major case of FOMO?